Welcome to Club Lynx! A Special Club for Parents and Learning Coaches! We greatly appreciate the significant role you play in your child’s successful learning and we know many of you tell other families about the great opportunities at our school. That’s why we created Club Lynx: We are always here to help you spread the word because truthfully, your word-of-mouth recommendation is what is growing our school. Therefore, we ask you to reach out directly to Shelly Centanni, our UVA Outreach Coordinator, and let her know about the work you are already doing to spread the word about our school. Besides having material you can use and which we are glad to send to you, we also want to recognize your efforts with special gifts and other opportunities developed specifically for Club Lynx members. So let us know you are out there telling your church members, your friends at the local coffee shop, your gym members… any family who needs our good news! 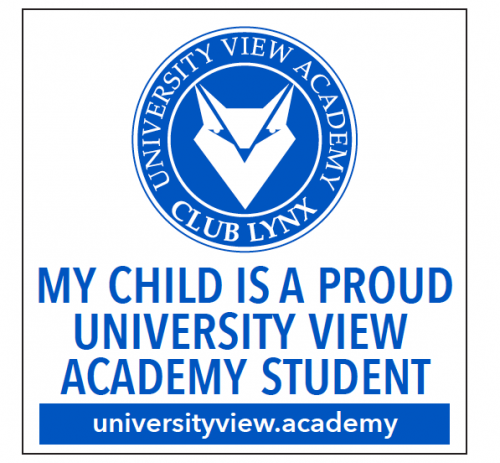 We want YOU to get the recognition your deserve for being our partners when one of your friends enrolls at University View Academy. Because honestly...we could not do this important job without you.